The Burton Agnes Jazz & Blues Festival, which began in 2007 is looking forward to its second decade, starting on the weekend of Friday 13th July to Sunday 15th July. 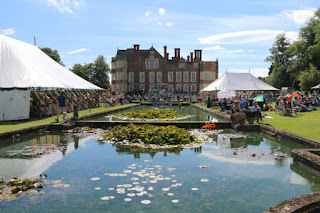 The festival is uniquely set in one of the UK's finest Elizabethan stately piles, our very own Burton Agnes Hall. Over twenty five bands provide a weekend of Jazz and Blues from our manicured lawns and inside our ornately carved Great Hall. We provide music for all tastes, from those seeking an ambient accompaniment to a glass of wine in the majestic and breath-taking grounds; to the jazz or blues aficionado wanting to get up close to star performers. Delicious baking from our courtyard cafe will be served in the tea tent; with locally roasted coffee brewed on our Gaggia coffee machine. There is a fabulous range of locally sourced food on our food lawn; next door to our vintage ice cream van and its real dairy ice creams. Award winning Wold Top beers will be on tap, brewed just a few miles away. There is camping for tents, caravans and motor homes in the beautiful surroundings of the adjacent Park Field, with hot showers laid on. For the children and young at heart there is balloon artistry and face painting and highlights of Burton Agnes' grounds including a maze, giant games, jungle garden and woodland walk with forest creatures to find. Marsden Jazz Festival has been awarded a national arts grant to help it raise its profile and secure new income from private donors. It is set to receive £30,000 from Arts Council England’s National Lottery Funded Catalyst Small Grants scheme to develop new fundraising opportunities for the annual event, (which costs up to £150,000 to stage each year). 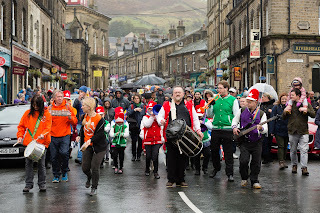 The festival was set up in 1992 to support local businesses and bring visitors to Marsden and it still does that today, with around 10,000 gig attendances every year. Over 150 hours of live music takes place in the village during the second weekend of October each year, including over 70 free gigs, with local school bands performing alongside international jazz superstars. The festival recently received national recognition on BBC Radio 3 when Jazz Now presenter Soweto Kinch described it as ‘one of the UK's most adventurous jazz festivals’ during the broadcast of a 2017 gig. “We’re delighted to have been selected for this Catalyst grant by Arts Council England and hope it will help spread the word about what we think is the country’s best jazz festival. 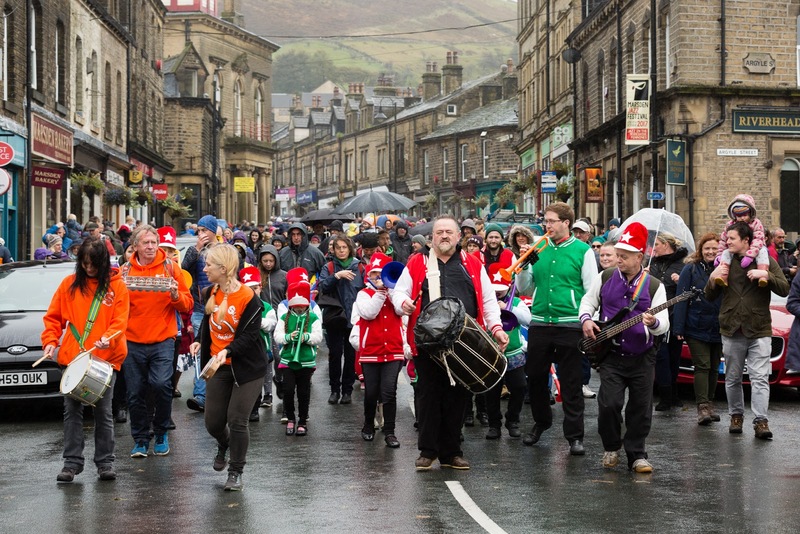 “Marsden comes alive with the sound jazz every October and the village’s location in the heart of the Pennines, along with its historic community buildings, makes it the perfect location for live jazz. Liverpool Hope University will host the sixth Liverpool International Jazz Festival (LIJF) taking place from Thursday 22nd to Sunday 25th February 2018. 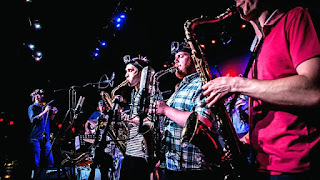 The emphasis is on contemporary instrumental jazz in a variety of styles taking audience members on a musical journey that traverses numerous genres and cross-genres including Funk/Acid Jazz, IndoJazz and Jazz Rock. Soft Machine (Sun 25th Feb). The majority of events will take place at The Capstone Theatre at Liverpool Hope University’s Creative Campus. Throughout the programme, there are support sets from North West artists, masterclasses and workshops from festival performers and after events organised by the Anti-Social Jazz Club taking place at Fredericks and The Buyer's Club in Liverpool city centre. Supported by sponsors and collaborators including LiverpoolJazz, Milapfest, Anti-Social Jazz Club, Curly Music, Trevor James and Jazz North, the most recent incarnation of the festival looks to be as dynamic and forward thinking as ever. 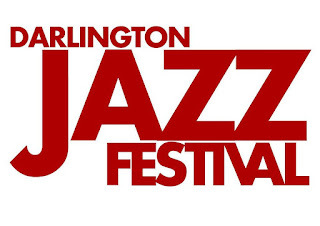 You can find more details about the Festival including box office links at http://www.thecapstonetheatre.com/jazzfestival/. 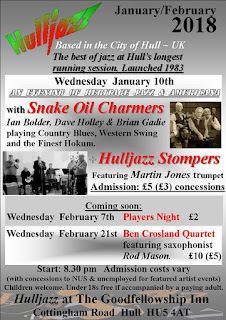 Firstly the 14th Jazz on a Winter’s Weekend in Southport at the Royal Clifton Hotel Southport runs 1-4th February. 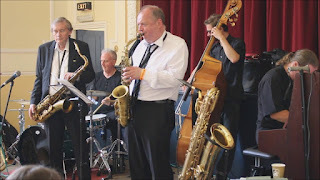 It once again incorporating the flavours that Southport has become well known for; international artists, challenging and contemporary jazz, some Big Band music and of course the best in British with a touch of North West genius. This year the International theme features Tricia Evy who plays the late set for us on Saturday night and we have Asaf Sirkis joining local heroes Mike Walker & Gwilym Simcock in the Friday late, late slot. 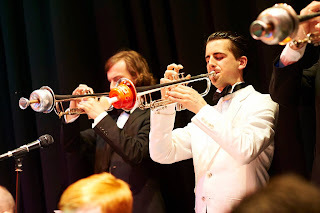 We are so blessed to have Swingtime Big Band on our doorstep and this year they are joined by the eminent vocalist Matt Ford who has sung with the BBC Concert Orchestra, Royal Liverpool Philharmonic and has recorded Cole Porter and Gershwin albums with the John Wilson Orchestra. They are sure to cook up a storm on the opening Friday night. And on the Sunday, Leeds College of Music Big Band are coming across the Pennines to let us listen in to the stars of the future. Last year’s Gala Dinner, where we got the chance to relax and enjoy a 4 course meal followed by Live Jazz was a complete sell out, so we are repeating this again on Saturday night with Ian Shaw – do book early. The welcome meal on Thursday stays in the programme, and we will be adding in a few extra food options to keep you entertained. 3rd – Alan Barnes + John Hallam + Tom Kincaid – one of the major highlights of the year. 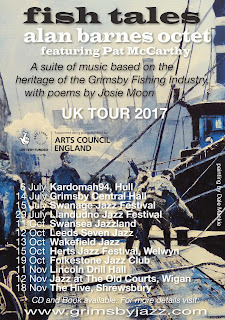 Two of the UK’s finest saxophonists come together as one of the most exciting musical combinations we are privileged to present. All this, coupled with the sublime piano sounds of the Tom Kincaid Trio plus Alan’s legendary sense of humour. Don’t miss this one. £10. 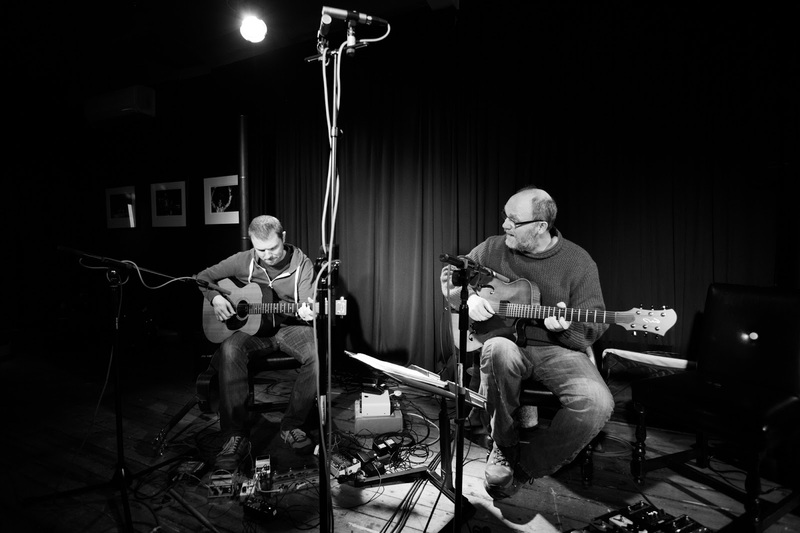 10th - Fret & Fiddle – this group from the Midlands comes to us highly recommended by Graham Smith of Shades of Jazz. Award winning musicians whose sounds are based originally on the halcyon days of the Hot Club of France and the subsequent musical career of Stephan Grappelli. Violin, guitar, piano, bass and drums. P.S. Graham backs up his initial recommendation by sitting in on this one! http://fretandfiddle.co.uk/ £10. 24th – Café Society – a long overdue return by this “off the wall” cabaret quartet featuring the outrageous Anthony Mason in his Noel Coward and George Formby roles complete with banjo and ukulele. Then add the undoubted talents of Andy Henderson on cornet, Phil Shotton on reeds and Colin Turner on tuba. It sounds different – it is different – and you’ll be overcome with laughter and sheer musical nostalgia. Thanks for your support – it’s what keeps music live. Spread the word – it is live, fun and friendly – no better way to spend Saturday evening. We have some great jazz gigs from national and international artists to look forward to in February and March (see below for details). Strictly Smokin' Big Band and Jazz.Coop present SSBB featuring Paul Booth. Please note that this gig is not at Jazz.Coop's usual venue, The Globe, but instead is being held nearby at Alphabetti Theatre. Winner of the BBC Scottish Young Jazz Musician of the Year at only 17, and Berklee College of Music’s prestigious Billboard Award, pianist/composer Alan Benzie is one of the UK’s most exciting young talents. Alan Glen, piano, John Pope, double bass. Sid White, drums. Review of their appearance at the Globe in January 2017 by Lance Liddle of Bebop Spoken Here. 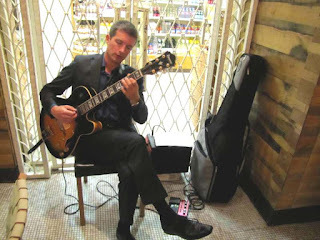 http://jazz.coop/alan-glen-trio/ The Glen Trio can warm up any room! Our ever popular Advanced Jazz Guitar course starts again on Tuesday 16 January. And it's not too late to join our Play More Jazz! course (you have only missed one session). Our long-running series of Play Jazz! workshops at Sage Gateshead start again on Saturday 3 February with Engagement and Stagecraft facilitated by actor, musician and performance artist Gabriele Heller. There are of course many highlights in the jazz year at Grimsby Jazz, but nothing can come close to the "Grimsby Fish Tale" project, which itself had at least three highlights! ich led to the suite being played on Christmas Day on Jazz Now. What a great finale to my last year as promoter of Grimsby Jazz. 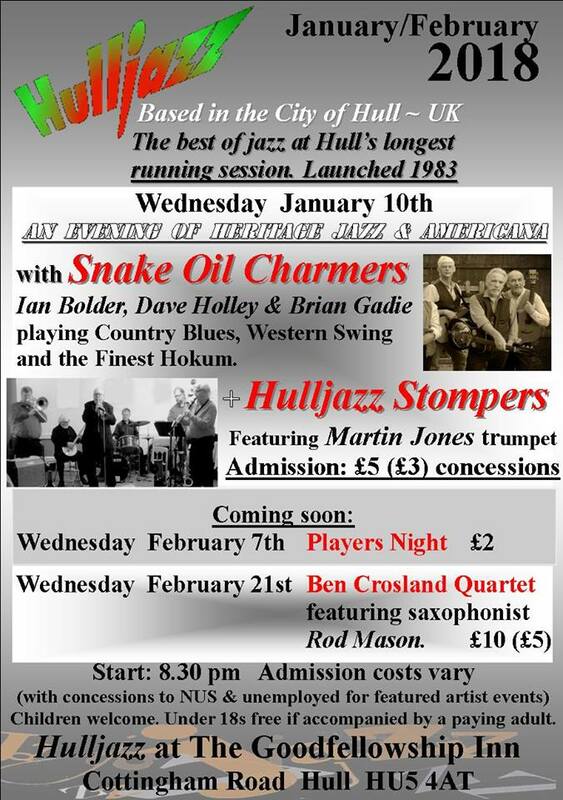 I am now passing on the reins to Warren Jolly at Moon on the Water to run the Grimsby Jazz gigs on a Thursday night. 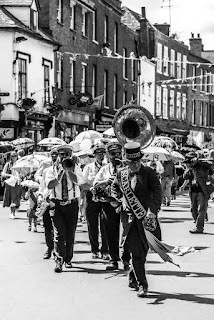 As a side note Grimsby Jazz is now in Cleethorpes following the tradition of our Grimsby Town Football team which plays its home matches in Cleethorpes!! As an extra highlight I would cite the Seamus Blake Trio gig in February 2017. A great gig organised by the amazing Kim Macari Stone-Lonergan supported by a Norvol Jazz initiative. Norvol Jazz is a great organisation run by inspirational people, it's been a privilege working with all you Voluntary Promoters over the years. Thank you all. A double bill this month! 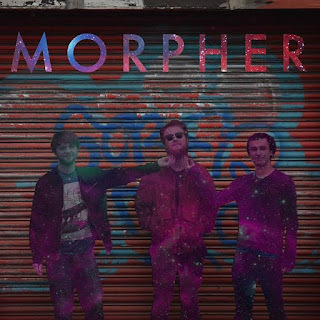 As part of RVJ&B support of up-and-coming young talent, we introduce student trio Morpher from Leeds College of Music. 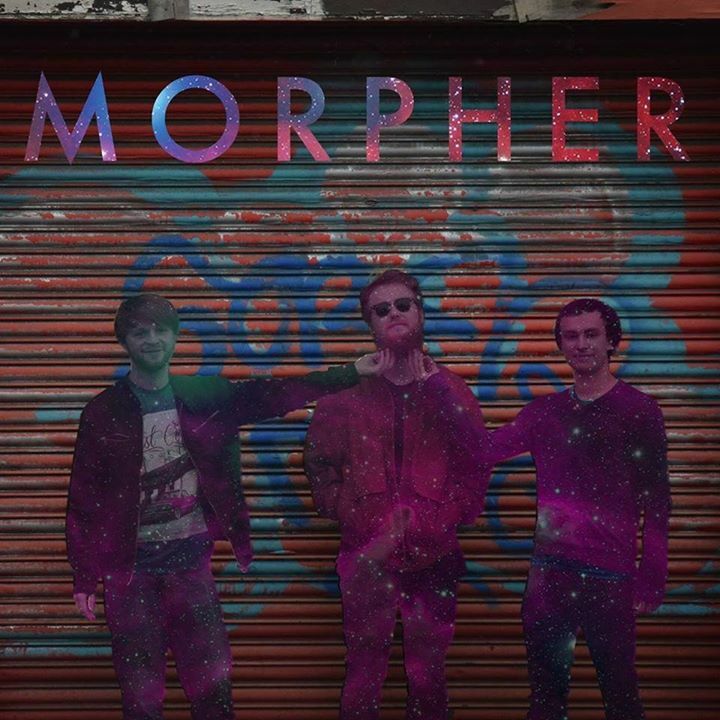 They use electronic synthesised effects to provide a mix of modern jazz and hip-hop. Followed by the Jamil Sheriff Trio. Jamil is one of the senior educators at LCoM. 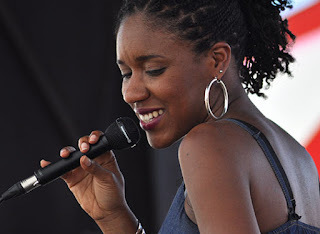 “Classy contemporary jazz with a personal stamp” The Guardian. The 2017 Keswick Jazz and Blues Festival can be described as a “wonderful rescue mission” under custodianship of a “marvellously dedicated new team” by organiser Ian Jones. Many know Ian as one of several regular sound engineers who worked with Keswick Jazz Festival for years. Music has been Ian’s lifelong career – professional musician, club owner and teacher, now sought-after sound engineer – familiar to many a festival and to many a recognisable musician. Ian and others were sorrowed to watch the Keswick Jazz Festival stagnate somewhat – to the point at which the Theatre by the Lake withdrew its custodianship altogether. Rather than stand by watching it disappear, as so many other Festivals have in recent years, it was realised some serious re-growth in the hands of someone capable might yet save it from this fate. “The folk who persuaded and helped are the ones who deserve the applause” Ian argues, as he has shied away from being called Manager, Director or indeed any other title. He insists on ‘only the organiser’ and remains quite humbled by the confidence placed in him and the support so many freely give. He says, as example, the “army of Stewards who came forward was overwhelmingly heartening, and the work Gill Scholey did (Steward Manager / Liaison Officer) genuinely fantastic too. It wouldn’t have happened without any of them”. Innovative long-term plans are already afoot - the classic Blues element will be further developed over the years to come, as it is even now proving its appeal to the broader market, and Jazz in the Keswick Jazz and Blues Festival will absolutely retain everything tradition demands. 14/3 Theo Goss's "Critical Mass"
Trish Clowes’ "My Iris "
Support from – Jasmine Whalley Quintet 8-8.30pm. 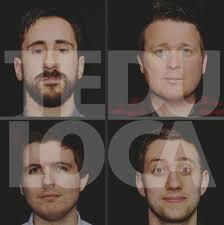 Will Howard - tenor sax Matt Aplin – piano Sam Jackson - double bass John Arnesen - drums. 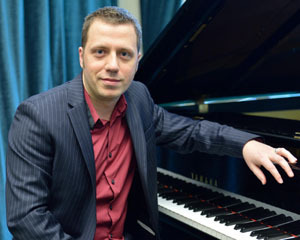 Matt Aplin is a young pianist, composer and arranger from Leeds. He has written and arranged for a variety of ensembles, including solo piano, string quartet, and jazz groups of various sizes. Stuart Macdonald saxophone, Dennis Rollins trombone, Martin Longhawn piano, John Marley bass, Tim Carter drums A pairing of two of our favourites, Stuart MacDonald on sax and Dennis Rollins on trombone. These two fine musicians play jazz that is melodic and mellow, or exciting and funky, and always hugely enjoyable, with a top quality rhythm section too. Tickets https://www.ticketsource.co.uk/event/FEEHHH. Season Tickets Spring 2018 save 40% off the price of all seven spring evening concerts and support JazzLeeds £89 Full or £79 concessionary price here - https://www.ticketsource.co.uk/event/FEKDKJ. 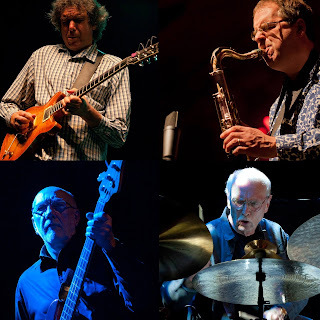 Further information on all events and links to our Facebook and Twitter pages available on our new website www.jazzleeds.org.uk Email address to contact us info@jazzleeds.org.uk See you soon as one of our events! Happy New Year! I hope you are well and had a great festive period. We’re spreading our wings this season with two gigs at different venues, and we’re also proud to present two milestone gigs; our own 5th anniversary gig featuring the wonderful guitar duo of Stuart McCallum and Mike Walker, and a 10th anniversary gig by the Beats and Pieces Big Band, who’ve just sold out 3 consecutive nights at Ronnie Scotts - we’re putting them on at Yellow Arch Studios, to make sure we can fit everyone in! There’ll be another milestone when we present a long awaited gig by Sheffield-based pianist Piero Tucci, featuring long term musical associates from his formative years in Canada. 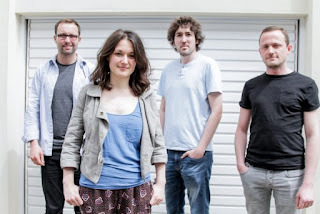 We also feature three bands with great new albums; rising star singer/pianist/composer Joy Ellis, an international line-up Bahla, who’s unique, beautiful and cinematic music is sure to light up the lovely Holt Cafe in Sheffield, and also Elliot Galvin’s ground-breaking, energetic and virtuosic piano trio. 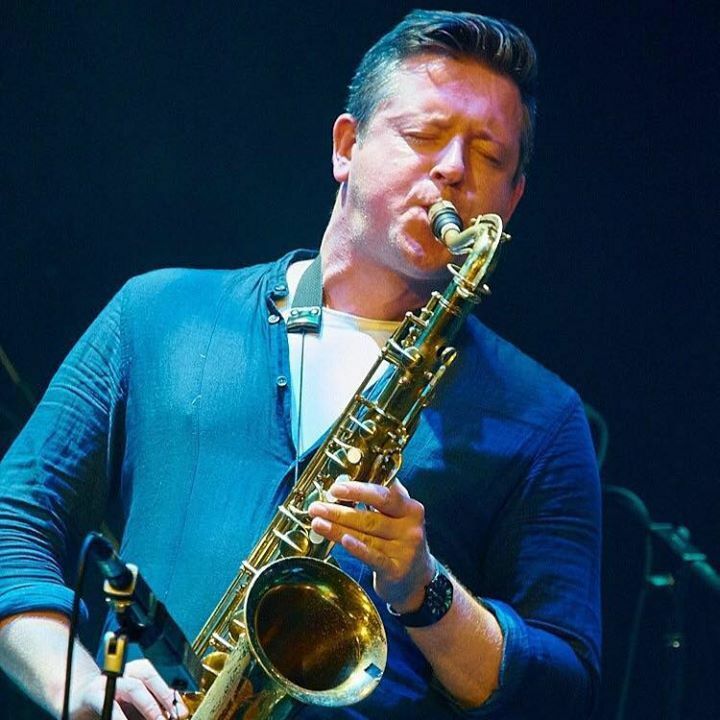 Two award-winning, distinctive and powerful sax players (Phil Meadows and Matt Anderson) make welcome returns with new line-ups, and we welcome (at last!) a pianist who’s been making waves, Rick Simpson, with a brilliant new trio. And finally two musicians with links to Sheffield, bass player Seth Bennett and guitarist Jamie Taylor return, Seth with a fiery eight piece line up, celebrating the music of Charles Mingus, and Jamie in his wonderful lyrical and swinging quartet with trumpeter Richard Iles, a welcome repeat of a gig that was one of our highlights in 2017. Many thanks as ever for your support. Best wishes, Jez. 6th – Savannah Jazz Band – and to help get rid of the post-festive blues, once again we have Yorkshire’s Premier Jazz Band always in fine fettle after the Christmas break. Traditional jazz at its best with some rollickin’ R & B thrown in for good measure. 13th – Tom Sharp Jazz Orchestra – the group began life as a rehearsal big band in Leeds and after a great success at a Christmas concert at Seven Arts in Leeds went on to win the prestigious Great North Big Band competition in 2016.The band consists mainly of young musicians playing the big swing favourites of the 40s and 50s. These are the tunes you all know and love. Let’s give them a true Boston Spa welcome. 27th – Kid Boyd Jazz Band – one of the most enjoyable and long lasting groups over the many years of JITS. A first class, varied repertoire for all sections of the audience and featuring such well known stalwarts as Frank Brooker on reeds, James Lancaster on trumpet and our favourite drumming man, Rod Macnamara. Highlights for me of the jazz year just passed at the Cinnamon Club! This lady is going to be star. A real tour de force display demonstrating superlative piano skills, but so much more more than that. Rhythm, timing, vocals that were rich and smooth, and song choices that delivered all night long. Ably assisted by the powerhouse rhythm section of Arnie Somogyi on bass and Stephen Keogh on drums, the Cinnamon Club was sold out - and rightly so. Champian had the chat, the guile and the guts to totally swing her show across 90 beautiful minutes. Go see her if you can. "The best show that Dale has ever delivered" said Bob Swift who booked this gig for him. 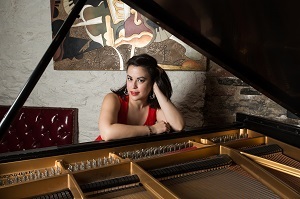 Confident, swinging jazz and blues from this superb pianist. Mastering all styles from New Orleans to Swing, to Dixie and stride piano, Dale chooses tunes that get the packed house on their feet. The boy can sing too, and James Booker is his obvious hero. Victor Brox was Dale's special guest and he was effusive in his praise for the Sheffield based maestro. Are we spoilt for having these two based in Manchester ? You bet we are, and these two innovative free spirits sucked us all in to an evening of guitar playing that pushed and pulled at all sorts of boundaries. The boundaries of songs we all know which are then beautifully taken into another plane, and yet gently return us home. And then boundaries of what we believe a guitar can do are broken before our very eyes as Stuart & Mike spark off each other, adding layer upon layer of emotional twisting and turning as they bring their own songs to the fore. We had a pin drop quiet masterclass of guitar playing.